Susan Gray and her colleagues were not Rosie the Riveters, but they made enormous contributions to the war effort. 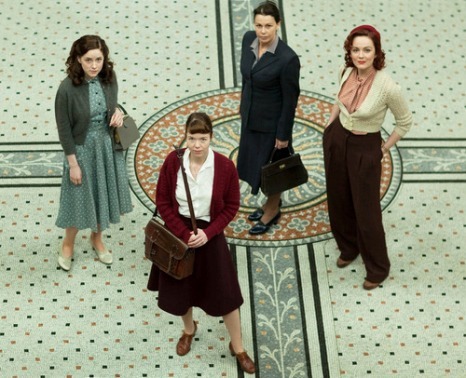 They served at Bletchley Park in highly classified capacities, sifting through data and cracking enemy codes. Then the war ended and they returned to the lives they were expected to live. However, as a serial killer’s body count mounts, they start detecting patterns the cops invariably miss in the three-part British series The Bletchley Circle (promo here), which premieres on PBS this coming Sunday. It is Gray, the profoundly bored housewife, who first applies Bletchley methods to a rash of murdered women. She soon recruits her former boss, Jean, now working as a librarian, and their colleagues, Millie a waitress with black market sidelines, and Lucy, a berated young wife with a photographic memory. 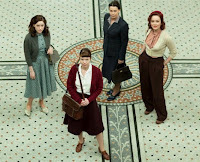 Since their work at Bletchley was subject to the Official Secrets Act, they are honor bound not to explain to their husbands or the police why they think they have skills to bring to the investigation. As a result, they get a lot of head-patting and condescension as they narrow in on the killer. Nevertheless, Bletchley’s criminal elements are smarter than average. Writer Guy Burt smoothly integrates numbers, patterns, and critical thinking into the story, while steadily raising the stakes in each episode. Their nemesis also turns out to be suitably diabolical, nicely played by Steven Robertson (a name so unremarkable it should not be spoilery). Yet, in a bit of a disappointment, it all ends in rather standard fashion. Anna Maxwell Martin’s Gray is an earnest, down-to-earth protagonist. Yet, of the quartet, it is Julie Graham who makes the strongest impression as their senior member, Jean. Rachael Stirling brings a bit of verve as Millie, but her character and backstory are the least developed, whereas the mousy, put-upon Lucy becomes tiresome over time. 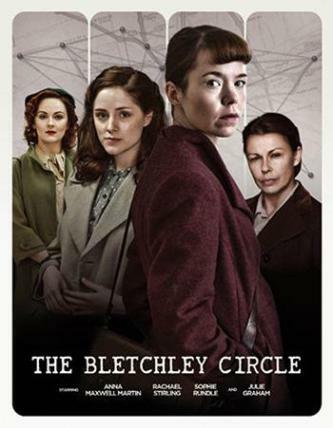 Bletchley has a great concept and it nicely conveys the experience of unraveling a puzzle through logical analysis. Like many numbers people, it is a little weak when it comes to interpersonal relations. Still, it is a decent fix for British whodunit fans when it begins this Sunday (4/21), following Mr . Selfridge, on most PBS outlets nationwide.